Today’s gospel is exciting! Jesus hands over the (metaphorical!) keys of the Church to St. Peter! And, what better image to use than this, which is a gorgeous and HUGE painting in the Sistine Chapel, one of the most beautiful chapels of all time used by the pope himself! It is an expansive painting that, while designed by Pietro Perguino, was so big that some of the best painters of the day — including Sandro Botticelli and Domenico Ghirlandaio — were hired on to help Perugino finish up the painting. The painting is stunning in many different ways… it centers on Jesus giving the keys to Peter, flanked by his disciples. In the background, the newly formed Church stands prominent. The trees and the nature behind stretch out, both as a kind of symbol for heaven that is now attainable through Christ and His Church, and also as a symbol of the new dominion of the Church, which stretches forth beyond what the eye can see. In short, it is a magnificent piece of work! 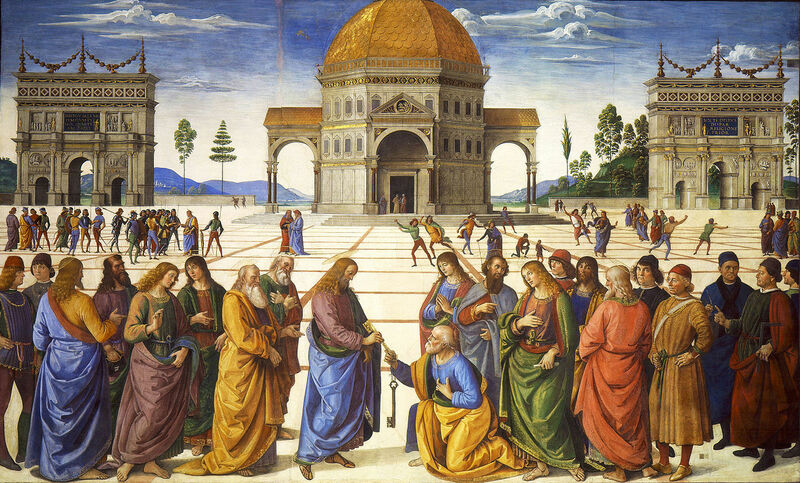 Handing the Keys to St. Peter, by Pietro Perugino, c. 1481-81. Sistine Chapel, Vatican City, Vatican City. 13 When Jesus went into the region of Caesarea Philippi he asked his disciples, “Who do people say that the Son of Man is?” 14 They replied, “Some say John the Baptist, others Elijah, still others Jeremiah or one of the prophets.” 15He said to them, “But who do you say that I am?” 16 Simon Peter said in reply, “You are the Messiah, the Son of the living God.” 17Jesus said to him in reply, “Blessed are you, Simon son of Jonah. For flesh and blood has not revealed this to you, but my heavenly Father. 18 And so I say to you, you are Peter, and upon this rock I will build my church, and the gates of the netherworld shall not prevail against it. 19 I will give you the keys to the kingdom of heaven. Whatever you bind on earth shall be bound in heaven; and whatever you loose on earth shall be loosed in heaven.” 20 Then he strictly ordered his disciples to tell no one that he was the Messiah. And I couldn’t help but to think of my own parents when I reflected on the gospel! God bless my parents, but they were terrified when I started driving. Me, the person who would jerk around violently and fall over while playing racing games… drive a car? Legally? That seemed a bit of a stretch! I had to save up money from my job to afford my first driving lessons, because they were terrified to do the initial lessons themselves. And, only then, were they willing to hand over the keys. But, this is way more than driving lessons… this is the Church! And Jesus trusted Peter to lead the Church? That seems mind-blowing! Yet, look at what happened! It’s been over two thousand years since the Church has officially started, and yet we are still following Jesus’ precepts (or, at least trying our best to! ), we are still praying the prayers that Jesus taught us, we are still celebrating His Sacrifice, and we are still amazed by the glory of God and the magnificence of the Church. Apparently, God knew what He was doing when He gave St. Peter the keys! Help us trust in You as we continue Your legacy through the Church that you established. Keep the Church always turning to You! And please, do not forsake our leaders, but always keep them in Your mercy.